Melbourne finished with kicking efficiency in the forward 50 of 31 per cent, compared to Essendon 45 per cent. The Bombers also won 26 contested possessions in their forward 50, compared to the Demons 19. Essendon scored 3.5. (23) from stoppages to Melbourne 0.5. 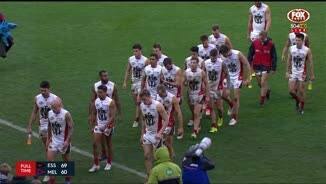 (5) despite Melbourne winning the clearances 4540. 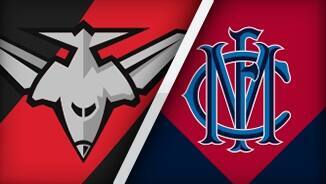 Melbourne with a 196 advantage in inside 50 entries in the final quarter that resulted in 3.5(23) to Essendon 1.2. (8), but the six third quarter goals to the Bombers the difference. Max Gawn finished with game highs for contested possessions (14), hitouts to advantage (15) and score launches (4). Alex Browne off the ground with concussion has played in his first win for the Bombers, more than four years after making his debut, which is the longest wait for any player in the past 20 years. The Bombers have scored 5.2. (32) from defensive half chains compared to the Demons 0.4.(4). Tom McDonald moved forward for the final quarter has more disposals (7) and marks (4) than any other Demon to go with 1.2. (8) and one kick out on the full. Melbourne InterchangeJeff Garlett off due to an injury. Demons InterchangeJeff Garlett off due to an injury. Melbourne winning the inside 50 count 133 and contested possessions 25-18 in the final quarter. The Demons get some reward for their control with their second goal for the quarter from a forward half intercept. They have had nine forward half chains to Essendon's one this quarter. Melbourne InterchangeAaron Vandenberg off due to an injury. Demons InterchangeAaron vandenBerg off due to an injury. Melbourne dominating the game with seven of the first eight inside 50 entries but has scored 1.3. (9) including two posters. Melbourne generate a 7th forward 50 intercept leading to a goal to Jetta. Essendon still have only one forward 50 intercept. Brendon Goddard has nine clearances, which is the most he has had as an Essendon player. Melbourne took two marks inside 50 in the third quarter for a score of 1.1. (7), compared to Essendon's five marks that resulted in 4.0.(24). The Bombers taking control of the clearances 155 and scoring 3.2. (20) to the Demons 0.1. (1) from this source during the third quarter. Melbourne InterchangeJay Kennedy-Harris was substituted into the game for James Harmes. Nathan Jones (20) and Bernie Vince (27) lead Melbourne for disposals, but both have kicking efficiency of just 30 per cent. Essendon has kicking efficiency this quarter of 64 per cent. Melbourne InterchangeJesse Hogan off due to an injury. Demons InterchangeJesse Hogan off due to an injury. 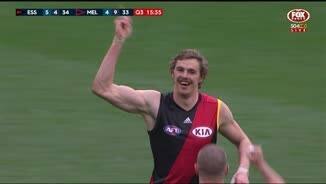 Joe Daniher who had kicked 1.8. (14) from set shots since Round 10, has kicked 4.0. (24) today. 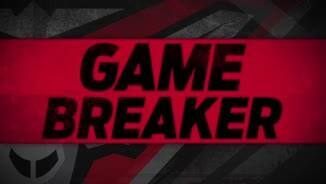 Essendon winning the clearances 82 and contested possessions 23-14 in the third quarter. Bombers InterchangeAlex Browne off due to an injury. 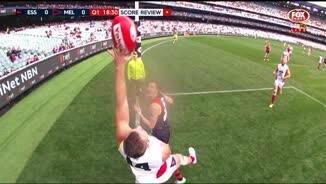 Demons InterchangeBernie Vince off due to the blood rule. Welcome to MCG for the Essendon v Melbourne Round 15 clash. FIVE goals straight from Joe Daniher has been the catalyst for Essendon's first win since round eight, with a pressure-lifting nine-point victory over Melbourne. 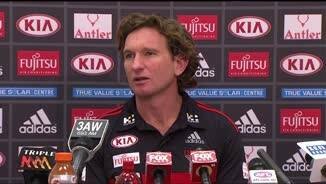 After being stung by 110 points by St Kilda last Sunday, the Bombers looked to be in crisis with the future of James Hird making headlines early in the week. But the players showed remarkable spirit on Saturday at the MCG to stave off a late Demons comeback that cut the margin to two points and shelve their five-game losing streak, 10.9 (69) to 7.18 (60). Paul Roos' men were in the contest to the main break, with the slick conditions caused by a pre-game burst of heavy rain contributing to the tight slog. 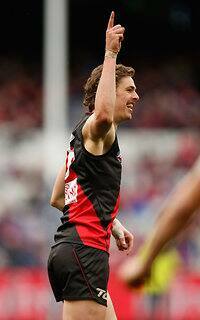 But they had no answers as Daniher found the accuracy that has plagued his form in recent weeks. Daniher (three goals) and Shaun Edwards (two) inspired the Bombers' six-goal-to-one third quarter, as Melbourne's forwards failed to fire. 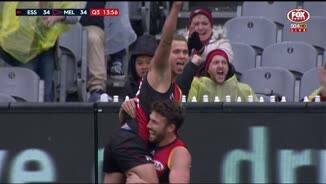 Then, the Demons fluffed five consecutive shots at goal early in the fourth – with defender Tom McDonald a repeat offender – before he and Jeff Garlett finally converted. In the telling third term, Jesse Hogan and Chris Dawes were blanketed by Michael Hurley – who was outstanding - and James Gwilt, and struggled to find a clean possession. It didn't help that Hogan and Jeremy Howe both spent time off the field having ankle injuries treated. 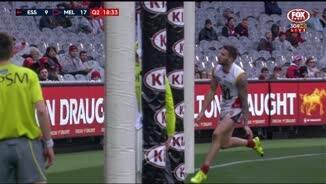 Howe was one of six single goal-kickers, and will await the outcome of the Match Review Panel that will look at his second-quarter tackle on Alex Browne that hovered dangerously close to a slinging motion. Browne, in his first game in two and a half years, was subbed out with concussion after hitting his head on the turf in the incident. The Bombers were led in the midfield by Brendon Goddard (29 disposals) and Brent Stanton (30), who both bounced back from disappointing performances against the Saints last week. They managed the win despite acting captain Dyson Heppell being curbed by Jack Viney, and Shaun McKernan soundly beaten by solo Melbourne ruckman Max Gawn. The loss of Jobe Watson and Adam Cooney cut the Dons' experience levels, which was compounded further on Friday by the withdrawal of Jake Melksham and Heath Hocking. But despite fielding a team with 12 players with less than 40 games to their name (the Demons had seven), the Bombers found a way to put a tough week behind them. Coach James Hird admitted it had been dangerous to play so many inexperienced youngsters but was delighted with the intensity they brought to the game. "One of the things Kevin Sheedy taught me as a player – and I talk to him a lot about coaching – is you shouldn't be afraid to play young players," Hird said. "They gave great effort, they made some mistakes, they didn't set up the ground exactly how we wanted but they did play. "I think they played a lot for their supporters and they genuinely care about what their supporters think and rewarding them for their support." Roos lamented the Demons' inability to consistently compete inside their forward arc but said there were positives to come from the way they played, which they'd focus on in the review as they looked to avoid another end of season fade-out. 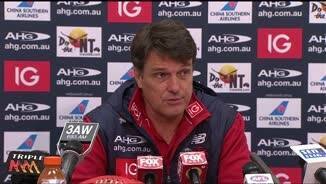 "Statistically, we were really good but that doesn't win you the game if you're kicking 7.18," Roos said. "That's the art of coaching a younger group and one that's coming together with players from other clubs and new guys coming in. "When we played the way we wanted to play, we played some really good football, which we have done over the last month, but it's keeping the players up when you have a bad result."